Stocos is a trans-disciplinary project that combines stochastic processes and artificial intelligence based simulations in order to create behavioral dependencies and aesthetic relationships between dancers, simulated entities, music, visuals and light. 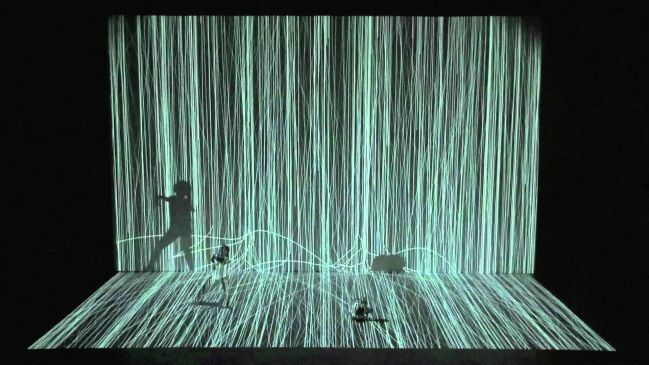 As a result, the stage becomes a responsive environment whose visual and acoustic properties emerge from the mutual interactions between the dancers, stochastic sound synthesis and swarm simulations. Stocos creates a three-dimensional space in which natural and artificial entities coexist, interrelate and overlap. It relies on stochastic processes and swarm simulations for the creation of dance movements, musical compositions and visual imagery. Throughout the performance, a dense network of mutual interactions among algorithms, dance, music and visuals establishes coherence, simultaneity and presence in the behavioral and aesthetic characteristics of the piece.